Both dry and sweet white wines have scored well above the reds in this vintage that saw a dry, warm summer and warm, damp conditions for the development of noble rot in October. All suffered from poor weather during budburst which had given early indications of small crops for 2013. The early harvesting Sauvignon Blanc grapes were fully ripened and the later harvest of Semillon showed a fresh acidity in the botrytised grapes, creating extremely promising wines. Where Ch. d’Yquem didn’t make their 2012 (but did make their dry white, “Y”), the winemaker, Sandrine Garbay, declared the 2013 vintage across Barsac and Sauternes as “really very good…and the conditions for noble rot wines were perfect this year”. Yquem 2013 leads the en primeur ratings, with a range of 98-99 points from James Suckling (JS) and 95-98 points from James Molesworth (JM), and is closely followed by Ch. Coutet scoring JS 90-91 and JM 94-97. The top investment grade Sauternes are tracked by the Liv-ex Sauternes 50, which also includes chateaux Suduiraut, Climens and Rieussec. All have reported good vintages, emphasising the freshness of the Semillon which imparts ‘lively perfumed and aromatic’ qualities to the vintage. Biodynamic Climens cited excellent quality from a small harvest – resulting in an ‘average’ yield of 10 hectolitres per hectare (contrast this with the 40-60hl average yield for top-drawer reds). While the vintage quality seems to have been well received, it is worth taking stock of the investment performance of these wines. 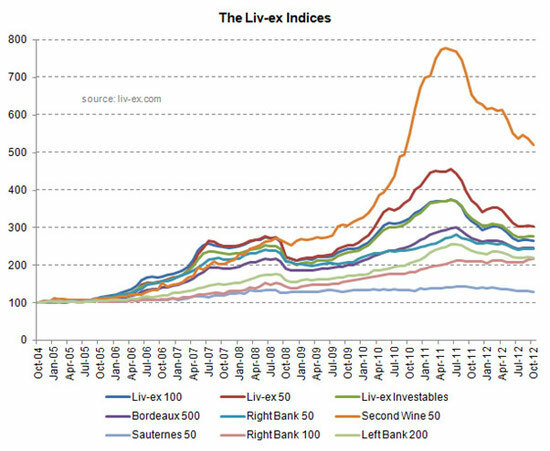 Historically, the Sauternes 50 index has performed consistently, but sadly also consistently flat. In the past three years it has almost wiped the positive market performance seen in 2006 / 07, and so on average these returns are only useful for providing stability to a portfolio. However, as Liv-ex notes, and three of the biggest movers in March were Sauternes: Suduiraut 2010 appreciated just over 12% in March of this year, Rieussec 2002 was up by nearly 13% and 2007 also from Rieussec reportedly gained nearly 17%. In context these wines trade around SFr 500 per case, whereas top Sauternes Chateau d’Yquem can often cost that much per 75cl bottle. Here we are looking at vintage 2005, which was generally very good for Sauternes: Robert Parker’s vintage chart gives the region 96 points overall. The graphs don’t go bottom left to top right in the pleasing way that 12% month on month growth would suggest. In fact over the last 5 years these prices have generally declined, indeed the most expensive wines by the most. 2005 was of course a great year across Bordeaux, and which were reflected in release prices. Looking back at the series on vintage ratings and returns, we are reminded that lesser vintages often outperform the very best vintages. The 2004 vintage was worse overall, averaging 82 in RP vintage charts, and “a very difficult year where the strictest selection was needed” according to Jancis Robinson. Below are more positive numbers from the 2004 vintage as these prices had some head-room to catch up with the higher release prices of 2005 and beyond. These are still not ideal investment returns, indeed some still negative in real terms, but they provide a nominally positive addition as well as stabilising a portfolio. Yquem had clearly risen to the challenge of 2004, with 6 tries (passes through the vineyard to find optimum-condition grapes) spread over seven weeks, and consequently their vintage 2004 has scored better than 2005 all round: Wine Spectator awards 95-100 points! 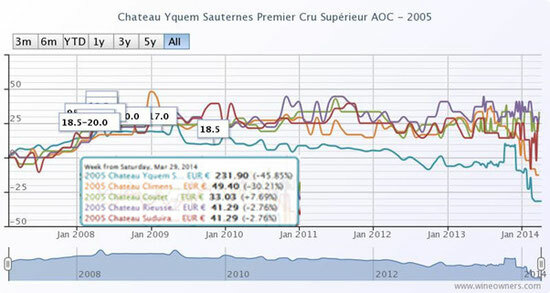 Below we chart one final comparison between Yquem 2004 and ’05, showing some modest returns over the last five years. A final note regarding merchants, who historically find it difficult to sell Sauternes. As merchants buy their en primeur allocations, they may be forced to bundle wines together: Lafite is often allocated in a bundle with Rieussec because of their common ownership in Domaines Barons de Rothschild. If the bundling practice prevails this year then look out for merchants with an unexpected stock of Rieussec, for which a lower price may be attainable.